Questions about where to find software like GarageBand for Windows pop in my inbox on a regular basis. Unfortunately, Apple doesn’t make Windows software very often. There are many Windows software apps offering a viable alternative to GarageBand, but most require a compromise on ease of use. For instance, Sony Acid is great for loops, but it’s hard to use. Propellerhead Reason is also great for loops and is equally hard to use. Acoustica Mixcraft is the one exception to this theme of complex Windows software like GarageBand. Mixcraft matches the simplicity of GarageBand with powerful recording features and music creation. Mixcraft is so good, I think Microsoft should buy Acoustica and offer Mixcraft alongside Windows Movie Maker, Photo Story, and their other media apps as the Windows version of iLife, but that’s another story. As a feature-packed audio editing and recording solution, Mixcraft includes all the best features of GarageBand for Windows 7 users. Mixcraft also works on Windows XP and Windows Vista, so if you have an older computer, you can still use it. In many ways, I like Mixcraft on Windows better than GarageBand on Mac OS X. Like GarageBand, Mixcraft makes it easy to create a song in a matter of minutes. Mixcraft is compatible with Apple Loops used in GarageBand for Mac OS X. Voice and instrument recording are supported, so you can easily record your garage band or church choir using both virtual and real instruments. Beat matching and key changes happen on the fly in Mixcraft just like they do in GarageBand. An awesome Musical Typing Keyboard feature that lets you use your computer keyboard as if it were piano keys. Download this GarageBand Alternative and try it for yourself to start making music on Windows 7, Windows XP, or Windows Vista. Mixcraft comes with an integrated loop library. Mixcraft supports additional loops from outside vendors, including the Apple Loops loved by GarageBand users. Beat matching and music key matching both just seem to work. You can adjust audio up and down with a rubberband tool inside each track in your composition. If you’re inclined to record your own music, Mixcraft supports both instrument and vocal recording. In certain respects, I might argue that Mixcraft is actually better than GarageBand, because Mixcraft lets you do things like save your finished song as MP3, WMA or OGG, instead of being limited to AAC as a compressed output format. The only thing Mixcraft currently doesn’t do that GarageBand does is make enhanced podcast files with chapter points and photos, which is far from a showstopper. 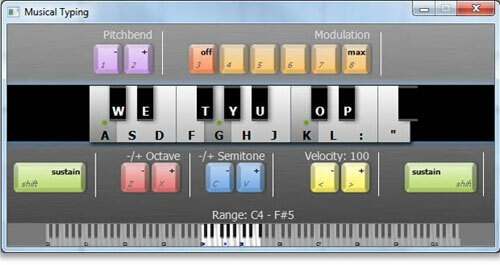 Turn your computer keyboard into a piano or other virtual instrument. The MTK makes it simple to translate your music ideas into notes in your Mixcraft song. Whether you are recording songs for your garage band or basement cover band, making music for the church choir, or simply plunking out notes, this digital piano makes a great solution for getting the notes from your head to the page. After you complete your composition, you can create a music score with notation. Mixcraft automatically scores your music composition so you can print sheet music or offer notation as a download. 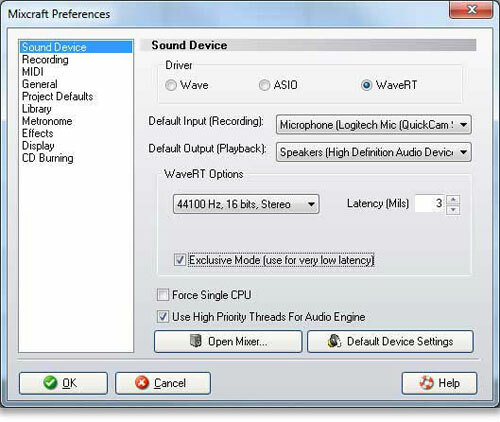 Windows 7 allows you to bypass the operating system and access audio hardware directly, which translates to low-latency recording with Mixcraft. For those familiar with turning dials on a real mixer, Mixcraft includes the ability to tweak the virtual knobs in your software music creation interface. For a basement or garage band on a budget, this allows you to get rockstar recording quality without needing an expensive recording studio. Mixcraft includes a number of instrument emulators and synthesizers allowing you to create sounds that are identical to a variety of real world instruments. The Lounge Lizard Sessions, for example, includes authentic sounds from Fender Rhodes and Wurlitzer electric pianos. Download Mixcraft for Windows 7 (as well as Windows XP and Windows Vista). Can I Connect a Keyboard to my iPad?